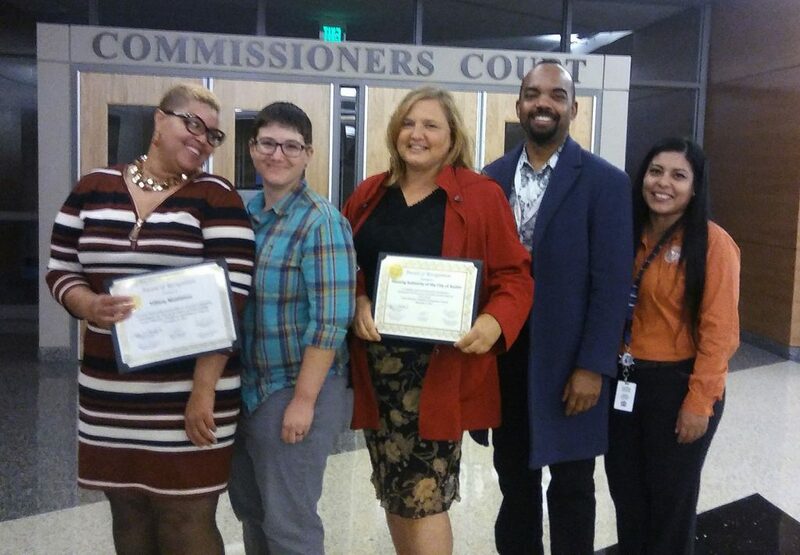 The Jobs Plus ATX team was recently honored during a 4th Annual Partnership Appreciation Day luncheon hosted by the Travis County Commissioners Court. Jobs Plus ATX was among several area partners recognized for contributions and collaborative support to Justice Planning's Workforce Development Programs. Organizations honored at the luncheon were celebrated for making a significant impact on the Austin community. Jobs Plus ATX is a U.S. Department of Housing and Urban Development program designed to completely immerse public housing residents at BTW and Chalmers Courts with the knowledge and tools they need to work their way toward long-term employment and self-sufficiency. Participants receive incentives for getting and sticking with a job. By signing up for Jobs Plus ATX, residents become eligible for Jobs Plus Earned Income Disregard (JPEID). When a resident is on JPEID, 0 percent of their wages from new employment or an increase in earnings at current employment are counted when calculating rent.